From March 23-26, 2017 the “Mission Group” in Singapore invited Marie Vianney and Mai Trinh to Singapore for the Celebration of the 10th year Anniversary Outreach Program. “This was an excellent opportunity for the RNDM Sisters in VietNam to thank all our benefactors for their generosity and warm heartedness. The Saturday Evening mass at Holy Trinity Church was celebrated in a spirit of wholeheartedness and gratitude to God and to each other. We deeply admired the Singaporean people as well as their country. In particular, we marveled at how they respected the environment and always kept the place clean. We expiernced the kindness of the people. There are now 76 Singaporeans members in the Mission Group, as can be seen in the photos. Paul Handidjaja, the President of the Mission Group also presented every participant with a beautiful thermos souvenir to remember the 10th Year Anniversary of the Outreach Program, from 2007 to 2017. At the end of the fundraising food festival, Sisters, teachers and representative parents of Thanh Tam Kindergarten prepared for a charity trip to Kon Ba Ha, a village of the Vietnamese indigenous in Gia-lai Province. We passed 700kms through towns and dangerous gravelled and hilly roads including 75kms forest road. After fourteen hours we arrived at the dead-end road which is Kon Ba Ha village belongs to Bana tribe. 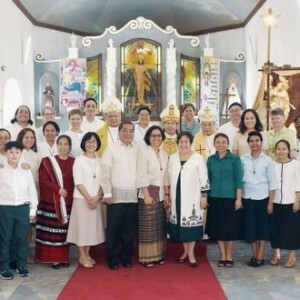 The only Kinh person is the parish priest. Some of tribes people can speak Vietnamese, the rest speak only Bana language. There are thirteen hundred villagers inclusive of six hundred children. Each family has from seven to ten members. After our arrival, we visited families whom we plan to provide with metal roofing and fencing sheets. In the afternoon the villagers gathered at the communal house to receive gifts that we brought. The gifts included, rice, dried fish, fish sauce, monosodium glutamate, milk, clothes and candies. In the evening, we attended the Eucharist, which was simple but very touching. Children offered Mother Mary gorgeous wild flowers from the village. 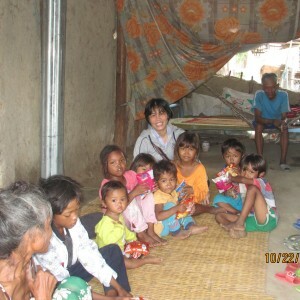 We experienced the deep joy in sharing and giving love, presence, and help to the indigenous of Kon Ba Ha Village. We profoundly rejoiced in the word Jesus told us “I have come that they may have life, life in all its fullness” (John 10:10). We admired Father Paul Nguyen Hung Son for his wholehearted love for the poor in that village. His presence and service surely be remembered and blessed. On the first of May, Srs Teresa Thien Huong and Anna Kim Oanh, members of the vocation promotion committee, with other Sisters and 22 boarding girls of Vinh Trang Community shared about RNDM life and Mission with almost 1000 youths from 20 parishes of Nha Trang Diocese. This program was organized by Vicars Forane of Cam Ranh and Cam Lam with the theme “Religious people– instruments of the Divine Mercy”. The presentation of Srs Thien Huong and Kim Oanh and the group was so creative with different activities such as sharing, sacred dance, video, power point and common dance. These activities enabled the youth to get to know us better and the feedback showed that they liked our missionary spirit. The place was full of joy, laughter and energy and reverent. Each group wore a different color which made the gathering so colorful. We hope that these candidates continute to nuture their dream is to follow Jesus and serve his people; and that in the Divine Mercy they try to show love to their family members and friends as a practical exercise to nuture their dream. May the seeds that we sowed today continue to grow and bear fruit that bring life to the Church and our society.